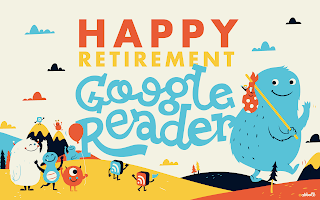 Well, today is the last day of the beloved Google Reader. As of this writing, it still seems to work, but that might not be the case by the time you're reading this. If you were a frequernt user of Google Reader, this throws you into a bit of a lurch since there is -- and I don't believe there's any hyperbole in this statement -- nothing quite like it. There are indeed a lot of different ways to follow RSS feeds, certainly, but the particular mix of features that Google Reader had is, to my knowledge, unique. With the additional impending demise of iGoogle... well, we've got no choice but to check out the alternatives. Here's my personal set of criteria that I'm working with. First, as noted, I read a lot of comics on different update schedules, so I can't rely on my memory to check bookmark links. Second, I work from at least six different devices with four different operating systems regularly, and often find myself working on others that I've never touched before. Which means that my comics access needs to me cloud-based, and not a stand-alone app. Third, I use my feed reader for ONLY comics. Any news type feeds I read directly through a portal set-up. When I learned that iGoogle was going away, I looked at portal alternatives and landed on NetVibes. It doesn't have the number of comics-related widgets that iGoogle has, but it's got enough that I can kludge some workarounds together. Not ideal, relative to the smoothness I found with iGoogle, but serviceable for what I wanted. It handles the news feeds well -- better, in some cases -- but the comics portion is pretty light by comparison. Google Reader's replacement has been more difficult. I've played around with all the alternatives people have been suggesting over the past few weeeks: Feedly and The Old Reader and everything. I even dove right into the Digg Reader when it was launched a few days ago. I've found quirks in all of them so far that make my comics reading a little less than optimal. Not that Google Reader was optimal, either, but the alternatives seem less so. Anyway, I spent a fair amount of time sorting out how to best read all my favorite webcomics in one easy-to-handle package back in 2008. It looks like I'll be doing more than a bit of time sorting that out again this year. The changing landscape is challenging to keep up with, to be sure, but I'm trying to look at it as a way to force me from getting too staid and comfortable with (potentially) outdated systems. Relying on habits without examining whether there are better/more effective methods is a sure-fire way to fall behind the rest of society, and these changes are a prime opportunity to re-examine webcomics' technology. As before, I'll likely provide a few updates on my progress and, hopefull, that'll prove useful to some of you who might be struggling to keep up with their favorites. It's been nice knowing you, Sean. THE WORLD IS DOOMED WITHOUT GOOGLE READER! Feed Wrangler sounds like the solution for you. It's $24 a year, but it'll allow you to sync your feeds across multiple reading apps, as well as a website. I'm stuck on IE8, so I can't see any website that competes with Reader, basically. I'm screwed.